Greddy High Pressure Radiator Caps are OEM style caps that directly replace the factory cap. 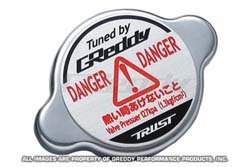 Not only does the metal GReddy badge on the cap dressup your engine compartment but the 1.3 KP/CM2 (18.5 PSI) pressure rating increases the performance of your radiator. Two types are available to fit most Japanese vehicles.